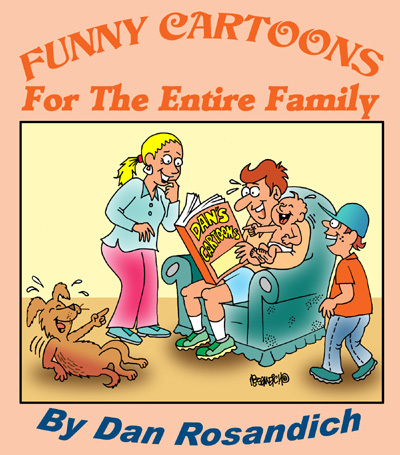 Charlton all-cartoon joke books with titles like Cartoon Carnival, Good Humor and others could be found at stores nationwide. They used so many cartoons, sometimes they’d publish entire batches of cartoons from cartoonists . . . Cartoon editor evokes “someone who reviews cartoons” for a respective magazine or publication. Just so you know ahead of time, this post won’t be referring to photo to cartoon software, nor will it be about photo to caricature programs. 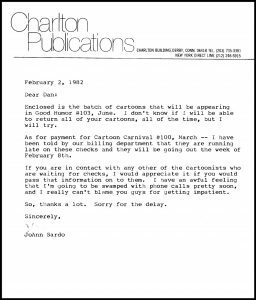 I was reminded how important the term “cartoon editor” was, back in the day when myself and dozens of other freelance cartoonists were circulating their cartoons to trade journals and national magazines and newsletters. I recently stumbled upon an old letter (yes, an actual typed letter on a sheet of typing paper!) 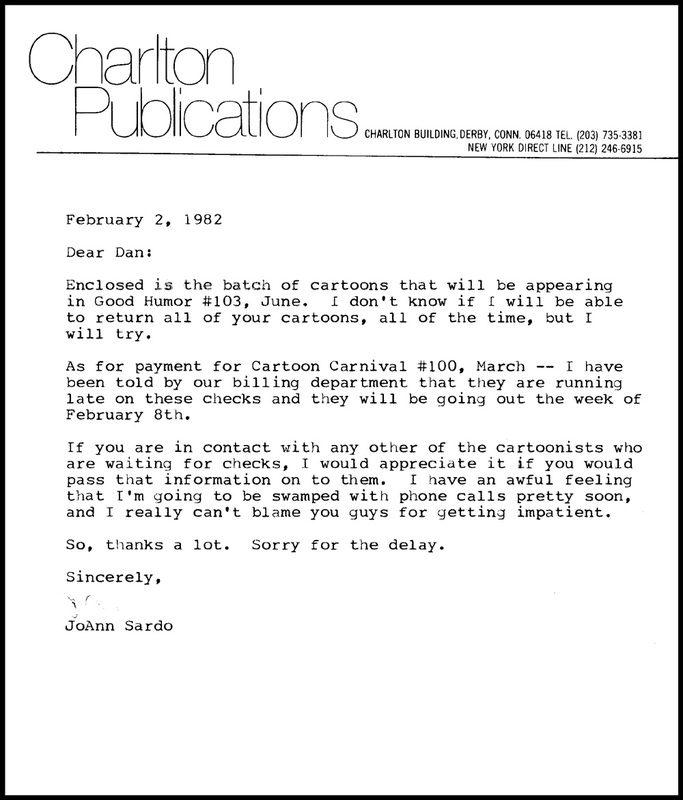 signed by JoAnn Sardo who was looking at cartoons for Charlton Publications. I think any magazine gag cartoonist who you know, will have been published in one of their all-cartoon humor magazines. When I first began drawing cartoons and sending work to various publishers, I wasn’t certain if they’d like my material or not. Like anything in the freelance business, it’s a gamble. You draw stuff up, package it and send it out. In those days, everything I submitted was through the U.S. Mail system. I was so naive and ignorant with my submission tactics. Actually sending original artwork to all of these places but I say naive, because at the same time I was learning from my mistakes. Mistakes like having editors returning my originals to other cartoonists….who luckily had the mindset to send the artwork directly on to me. That was how I began conversing with so many of my fellow ink slingers, trading tales of woe (lost submissions, damaged materials, slow payments etc.) and of course learning various tricks of the trade so to speak. I started making it a habit of asking editors to return all previously published originals, and this is what JoAnn was writing about in the letter I’m sharing here. Obviously she was one of those conscientious editors, which I appreciated. I was literally “flooding” the market with my work, sending originals to whomever, wherever I could and got wise to the notion of keeping my originals . . . from a copyright perspective. Cartoonist George Crenshaw taught me to make copies of the same original cartoons, and make multiple copies of each cartoon and this will allow you to make an even larger impact by sending those same multiple cartoon submissions to literally dozens of other similar publications while retaining the rights to each of those cartoons. In the late 1970’s and into the 80’s, JoAnn was one of my favorite editors. Not because of her interest in my work alone, but since she was conscientious, from the cartoonists’ standpoint. They were not a “top” market, but they did use dozens and hundreds of cartoons each year and in fact, I’d give her “first look” at new cartoons, simply because she liked my stuff enough and I appreciated her in return, for it. They’d return originals and I’d simply copy those and re-submit to whatever new cartoon buyers there were at that time. As many cartoonists will agree, the print market is not what it used to be for gag cartooning because of the affect of the web (look at it’s effect on big brick and mortar giants like J.C. Penney, Sears etc.) but it’s worth noting and hoping there are future editors in the digital realm who will be as conscientious as those like JoAnn when it came to the value of single panel gag cartoons.